Today is the first day of your student tour in Turkey. We will meet you and transfer you to your hotel. Check-in to your hotel and get the key of your room. The rest of the day is yours to rest and enjoy and we will meet in the evening for welcome dinner. Good Morning. Your tour guide and your driver are at the lobby to take you for your Istanbul’s Highlights Tour. Today’s programme will start by visiting the ancient Hippodrome where you will get to know all details of its transformation, obelisks and functions during history. The Hippodrome is hand by hand with the world famous Blue Mosque so we will be entering Blue Mosque after our Hippodrome Tour. Sultanahmet is named by it’s visitors as Blue Mosque because of the magnificent tiles and breath-taking decoration inside. You will have a fully guided tour here. The next stop of your Istanbul Student Tour is Hagia Sophia, which is one of the must-see places in the whole world. 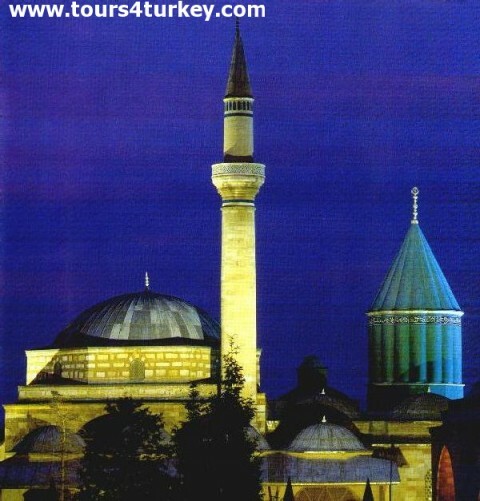 The whole story and history of the Hagia Sophia church-mosque-museum will be presented by your guide. Your guide will take you to lunch in a very good local restaurant. Here you will have the chance to talk and make critics about your tour and some rest for next visiting place The Underground Basilica Cistern which was the water-warehouse for Roman’s & Ottoman’s Istanbul. The driver will pick you up after your fully guided Cistern Tour and will take you to your hotel. We wish you a nice comfortable night. Overnight stay at hotel in Istanbul. After breakfast we depart very early for our tour in Gallipoli. Gallipoli is called Canakkale in Turkish and that was one of the high points of world war one. One of the biggest tragedies of the humanity happened here and more around half a million people from different cultures-languages-countries all confronted the same end. Today we will be visiting the main battlefields in Gallipoli area which covers; Chunuk Valley, Anzac Cove, Memorial cemetery and many other battlefields and also a local museum which founded by a farmer living around the harbour. Lunch will be served during your tour and after the tour you will be taken to your hotel. Overnight stay in Canakkale. After breakfast we will depart for Troy Tour. Troy is one of the famous ancient cities and an important town of Hellenistic Culture. 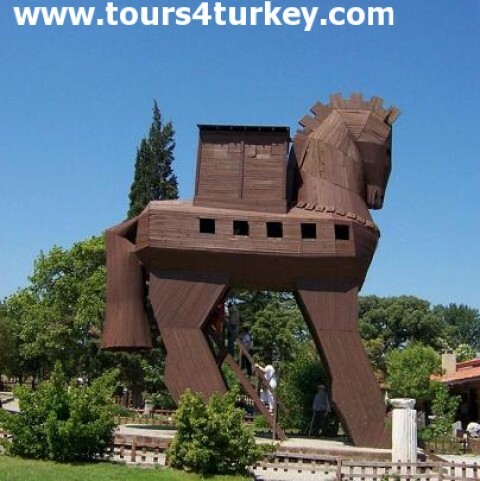 Here you will be visiting the ancient city of troy and also will see the Trojan Horse. After the tour you will have lunch at a local restaurant and then drive down to Kusadasi for overnight. On arrival check in to your hotel and enjoy the comfort at your hotel. Today is the time for a marble white, history long and holy land tour. One of the best preserved ancient cities on the world : Ephesus and it’s most important guest Virgin Mary’s house are the destinations for today's tour. This daily Ephesu tour will be one of the highlights of all your travels and also as one of the Ancient World Wonders will get a place in your photo albums. After the Ephesus tour you will visit the house that Virgin Mary spent her last years in. Then you will be transferred to your hotel in Kusadasi for overnight stay. After Breakfast check out from hotel. 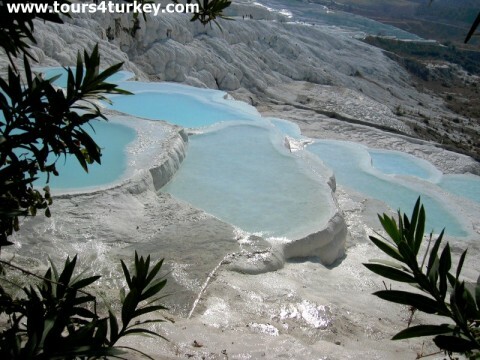 Then you will be transferred to Pamukkale the city of Cotton Castle. Overnight in Pamukkale at a thermal hotel where you can enjoy the waters at your hotel. A bright morning for the world’s only cotton castle, Pamukkale which is happened after warm tears of the nature. As if the beauty of the white pearl on Cleopetra’s chest was the inspiration for this art work of the nature. Today you will see the ancient city of Hierapolis and Cleopatra’s private swimming pool and also walk in calcium rich warm pools of Pamukkale. After the tour we will drive to Konya. Overnight stay in Konya. After breakfast we will be visiting the Mevlana Center. 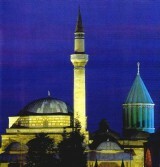 Mevlana Celaleddin Rumi is the founder of this big sufi school and philosophy. 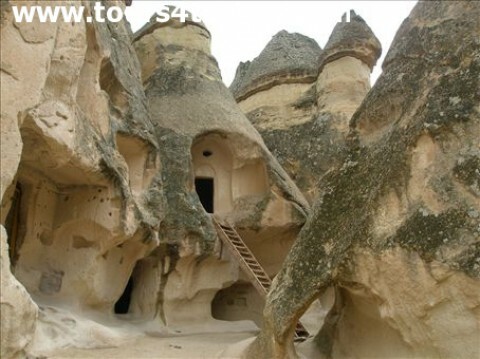 We will have our lunch at a local restaurant and after the tour we will be driving to Cappadocia. Your guide and driver will be waiting for you at the lobby after you've had your breakfast. Today is the day to explore the must-see places in Cappadocia. 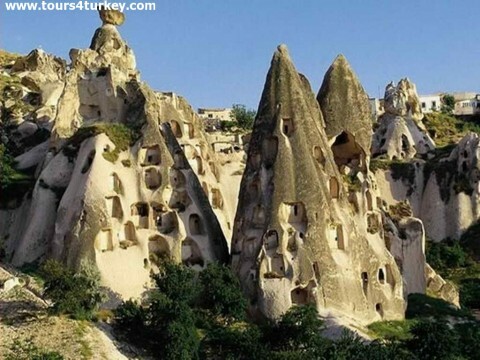 The tour will cover Goreme Open air museum, Rock Churches, Uchisar Castle, Rock Castle, Cavusin Old Greek Village, Pasabagı Fairy Chimneys, Avanos Pottery Demonstrations, Devrent Imagination Valley and finally Urgüp Wine Tasting. You will have lunch in a very good local restaurant on the tour. After the tour we will take you back to your hotel. We wish you a nice and comfortable night. Cappadocia is more than we have seen yesterday so we are having our second Cappadocia tour today by visiting Goreme Panorama, Derinkuyu Underground City, Ihlara Valley, Belisırma Village, Selime Monastery, and Uchisar Pigeon Valley. Today we will have our lunch in another restaurant to taste another dish from Turkish cuisine because visiting a country is not only about sightseeings. We provide you with an extensive experience from history learning to tasting the cuisine of this country. Overnight stay at hotel in Cappadocia. After breakfast we will be driving to Ankara, the Capital of Turkey. 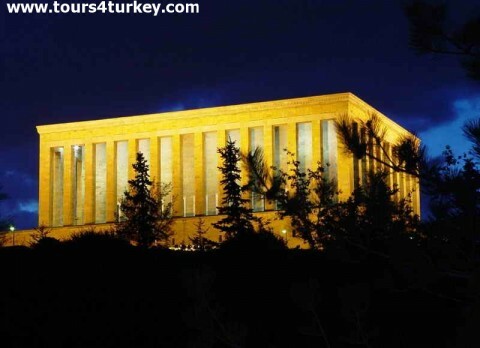 Here we will visit the Anatolian Civilizations Museum, Ataturk’s Mausoleum and First Parliamentary Building. Today we will have our lunch at a local restaurant to taste another dish of Turkish Cuisine. After the tour you will be transferred to you hotel. After your late breakfast we will depart for Istanbul. We know you had a long journey. 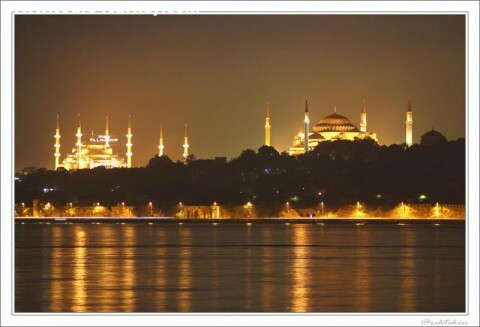 So we have scheduled to take you to your hotel upon arrival in Istanbul so that you have free time to rest. You have had an amazing time during your tour and now we want you to celebrate it in between two continents on beautiful waters and shores of Boshporus. 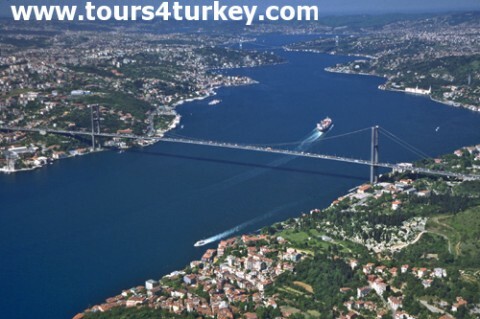 Bosphorus is the river which divides Istanbul in two parts : Asian part and European part. This makes Istanbul one of the most important cities on world to be based in two continents. Bosphorus is actually a panoramic summary of history and art in Istanbul. The houses, palaces, pavilions and gardens on shores will give you a great feeling. You will be visiting Istanbul’s highest peak Camlica Hill and have your lunch there. After your tour we will take you to your hotel. Today is the last day of your Student Tour in Turkey. We hope you had a great time with us. The 14 days that we have spent with you gives us a big pleasure, we hope you liked our tours, services, staff and especially our friendship. We definitely want you to keep us in mind and tell good stories to your friends and families about Tours4Turkey and Turkey. Thank you very much for travelling with Tours4Turkey. Hope to see you again in the future.